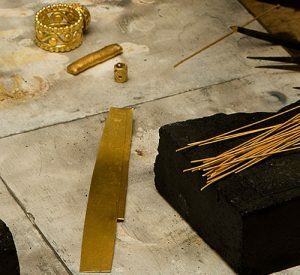 The goldsmiths of Studio22k are dedicated to carrying on the traditions of ancient high karat gold jewelry inspired by cultures of ancient Mesopotamia. Gold taken directly out of the ground generally has other elements attached to it and has to be cleaned before the gold can be used to make jewelry. Ancient cultures did not have the same capability to separate the other elements out of the gold as we do today. Therefore, the gold in ancient jewelry would have been equivalent of todays gold between 20k to 23k. The purity of the gold makes a large difference in the way gold is worked. Our 22k gold is most likely the closest mix of gold to that used by these ancient goldsmiths. The techniques which were developed by these people were very specific to high karat gold and do not lend themselves to other gold mixtures. 100% Purified gold today is 24k. Other metals/ alloys are added to create different percentages of gold and colors of gold. The techniques of high karat gold that we specialize in are: Fusing, Granulation and Filigree. Fusing is the main principle. 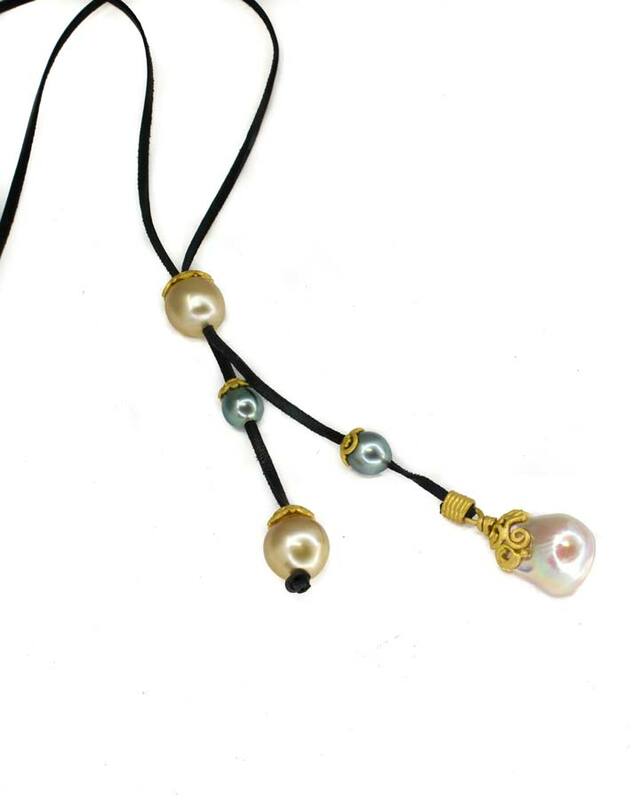 Fusing is when individual units of gold are joined together through a concentrated heat source. 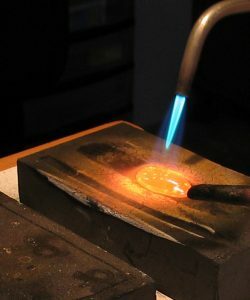 The surface of the gold is heated to a near molten state. With too much heat the components are completely melted and with too little the process won’t hold. The main techniques that rely on fusing are Granulation and Filigree. Granulation involves the joining of tiny handmade balls to a base of sheet metal or wire. Each individual ball and wire design is made by hand then placed on the metal using small tweezers or a feather tip. It is said that the Etruscan goldsmiths have never been surpassed in this technique. Filigree is an ancient form of delicate wire work that is either open and /or backed by sheet metal. 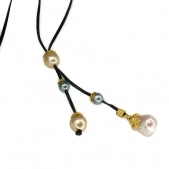 The wire is first prepared and pulled out/drawn by each jeweler in a variety of thicknesses. Then the wire is shaped into lace like forms that are made to fit together like a puzzle. Next the complete design is heated to pre-molten state where the individual parts fused together. This technique demands small scale manipulation skills, good vision and a great deal of patience. These techniques were first seen in Ancient Egypt and Mesopotamia, and then later in Africa, Hungary, India, and Russia. Repoussé, coming from the French verb meaning “to push against”, is a process of shaping sheet metal with special tools and hammers to form a three-dimensional sculptural effect. The art of Repoussé goes back to the Bronze Age and is often combined with a companion process called Chasing. Chasing creates a play of light and shadow by using outlines, undercuts and texture on the opposite side of the Repoussé metal. Unlike punches, there is no loss of metal. Rather, the metal is moved by the Chasing tools. The goldsmith must first begin by forging and shaping the tools needed to fit their design scale. There is no room for mistakes. Forging is a technique to shape metal into desired forms using compression force, mainly through intermittent hammering and multi-directional movement. This creates endless effects on different surfaces. Bending, twisting, cutting, rounding up, spreading, and drawing down are a few examples. This process is one of the oldest ways of metalworking done by mankind.